Artwork by Dread Scott (BFA 1989). Photograph by Annie Flanagan for "The New York Times"
Dread Scott (BFA 1989) and AIADO faculty Ekene Ijeoma have contributed to a New York Times op-ed titled Monuments for a New Era. Scott and Ijeoma are two of the six artists invited to "contemplate" the legacy of confederate statues as "markers of our country's racist and violent history,” a year after the "Unite the Right" rally in Charlottesville, Virginia. Scott's proposal, entitled The Legacy of Slavery Is in the Way of Progress and Will Be Until America, Which Benefits From That Legacy, Has Been Replaced With a Completely Different Society, is to lay "the upended column across the road." This "impassable" and "intentionally inconveniently placed eyesore, disrupting travel and commerce," would force visitors to "confront how slavery and the ideals that maintained and rationalized it continue to stand in our way." Ijeoma's reimagined monument aims to turn visitors from spectators to participants. The double-helix structure will comprise a six-story stone pedestal surrounded by a stairway. 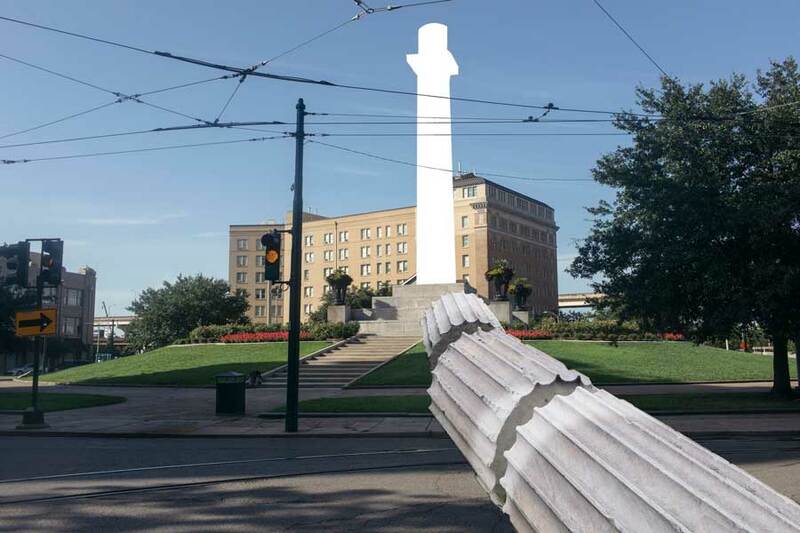 The pedestal will be stained red, yellow, and green, to mark 339 years of slavery, 89 years of segregation, and more than 60 years of ongoing inequality, respectively. The monument would emphasize "healing... through reconciliation," while acknowledging "ongoing manifestations" of a history of slavery and segregation.